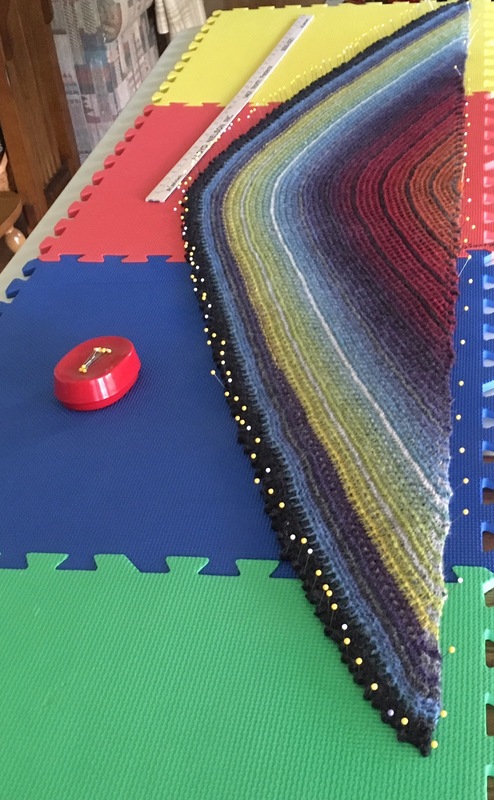 The Noro Hitchhiker shawl/scarf came off the needles last Friday. I haven't blocked it yet, but that will happen soon. This scarf has 35 "teeth." I probably would have had enough yarn for two more teeth, but I didn't want to chance it. Knitting notes can be seen here. You may remember the pile of sixteen patch blocks (79 completed blocks) I made in July. From that stack of blocks, I made Twirling 16s and Crossing Paths, but I still had 23 blocks remaining. 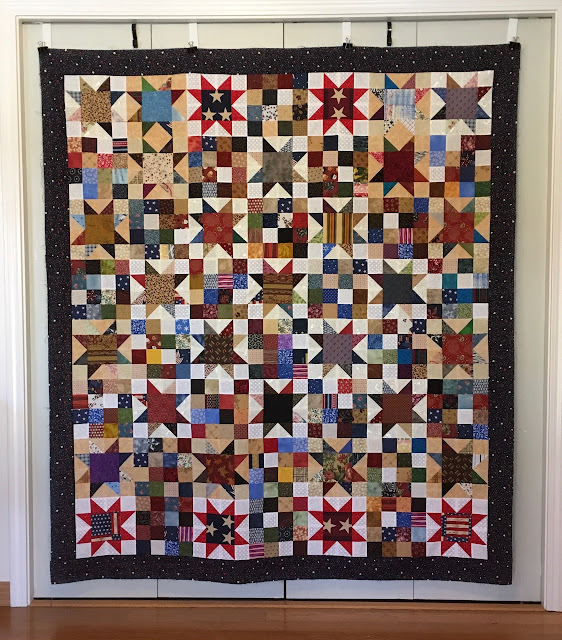 I used "waste" HSTs from other quilts, paired them with 5 inch squares from another scrap bin, and made the star blocks. The sixteen patch and star blocks came together nicely. 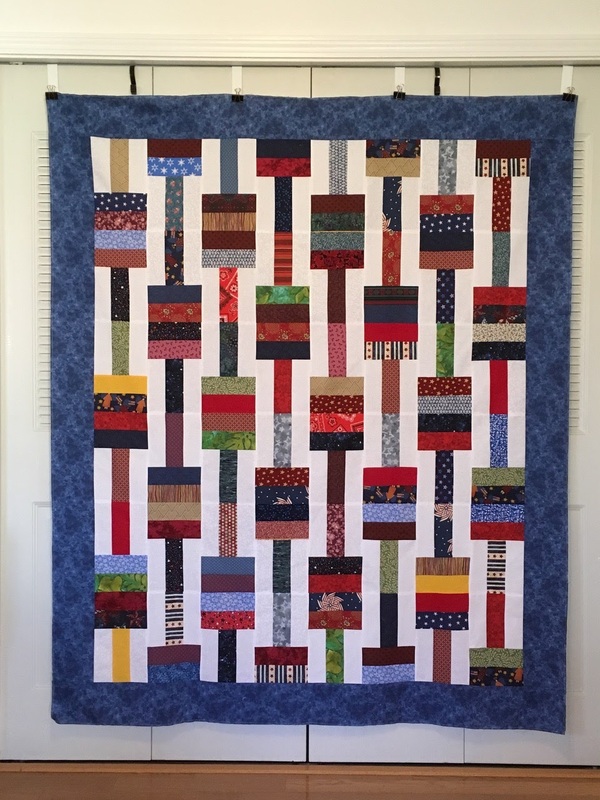 Other than the blue border, this quilt was made entirely from scraps of other Quilts of Valor. 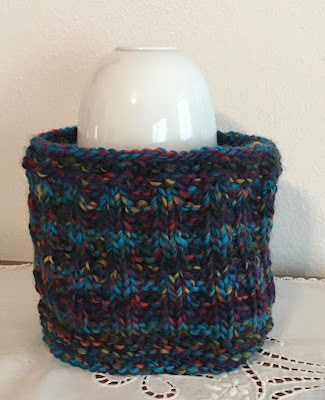 Saturday evening, I turned a single skein of bulky yarn into a cozy cowl. The finished cowl stands 6.5 inches tall and is 22 inches in circumference. 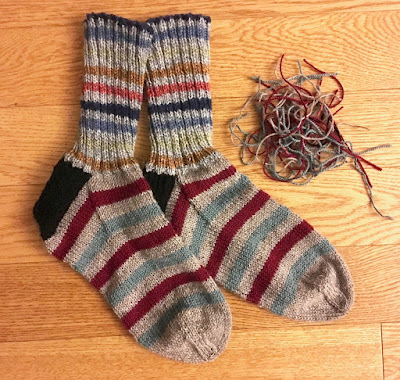 I've knit this pattern before (shown here and here) for gifts and donations, and I have one for myself that I wear when shoveling the walk and driveway. It's a quick knit with bulky yarn or double-stranded worsted and big needles. 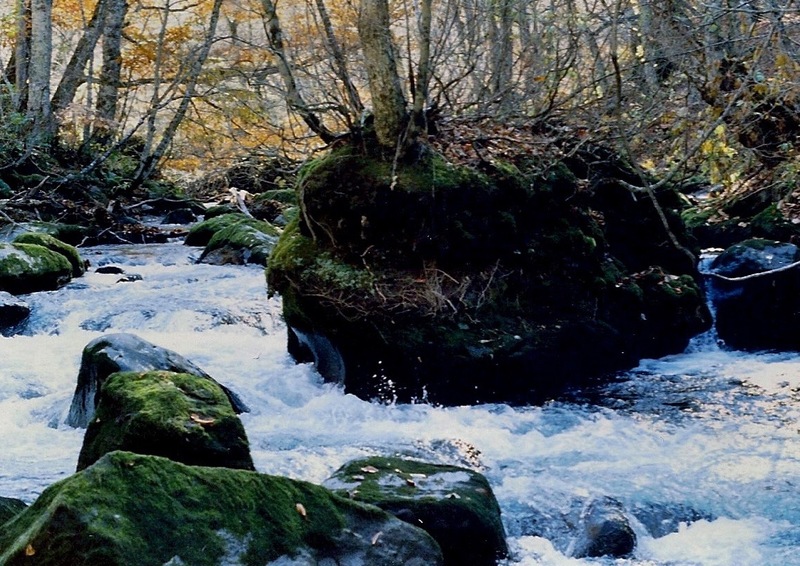 Because of the high humidity and frequent rains, moss was common in Japan. It grew on rocks, sidewalks, in the cracks of the parking lots, and basically anything that didn't move. Wyoming Breezes was started in 2007 with this introductory post. I've enjoyed sharing my thoughts, my opinions, my memories, and my projects for 9 years. Can you believe it totals 2,250 posts? That's definitely a lot of "hot air." 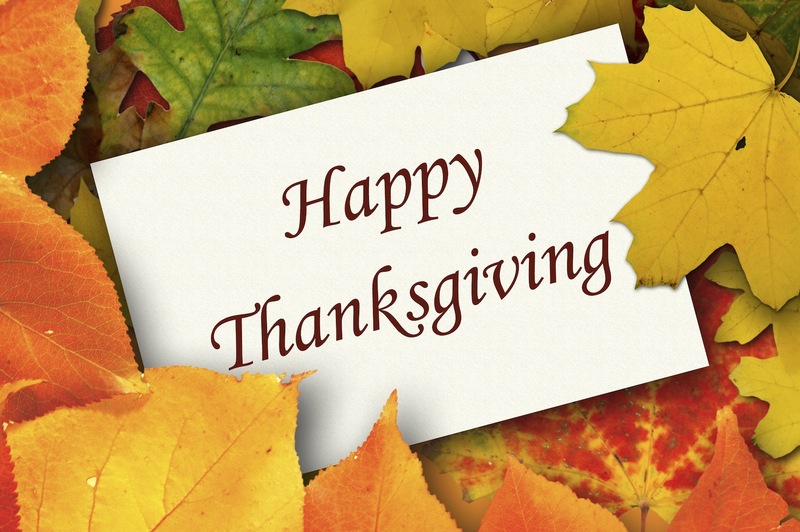 I'm thankful for those who stop by and read the posts, and I am appreciative of those who leave comments from time to time. Over the years, many commenters have become online friends, and I enjoy chatting with them in emails and even meeting them in person. Today, I feel blessed that visitors continue to stop by and read my "hot air." Hmmm, could it be more obvious that I've got my share of stitch markers! 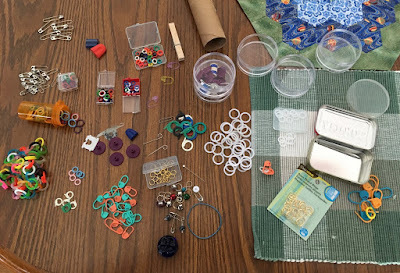 It's embarrassing to admit that the photo does not include all the stitch markers I discovered in various boxes, bags, and tins scattered in knitting bags and next to my favorite knitting chairs. I grouped the various markers by type and size and then separated them into two categories: those I wanted to keep and those I no longer wanted. 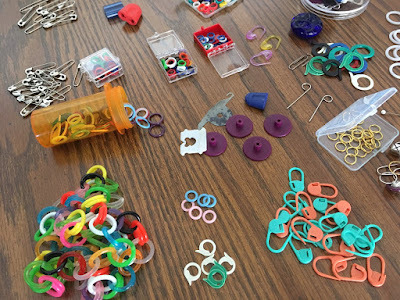 Do you see your a favorite type of stitch markers in one of the photos? For some reason this pair of socks kept getting pushed aside, moved from the table beside my knitting chair, to the coffee table, and then finally stuffed in the bottom of my knitting bag. I unearthed them on Friday and managed to finish them on Sunday. 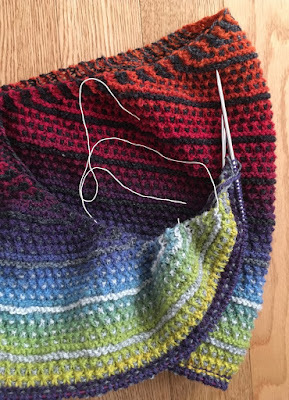 Knit with scraps from five different yarns meant lots of ends to contend with once the final stitches were grafted. Knitting details can be found on this August post. Something Whispered . . . While walking last week, a melody and some lyrics surfaced from long ago - a memory from 1967 or 68 and a time when I sang in the high school choir. The school's music teacher was Clayton Arnold, a man who loved music and loved teaching choir and band. His wife Sammy was the accompanist for the choral performances as well the one who often came to the classroom to play while Mr. Arnold instructed and worked with the various choir sections. 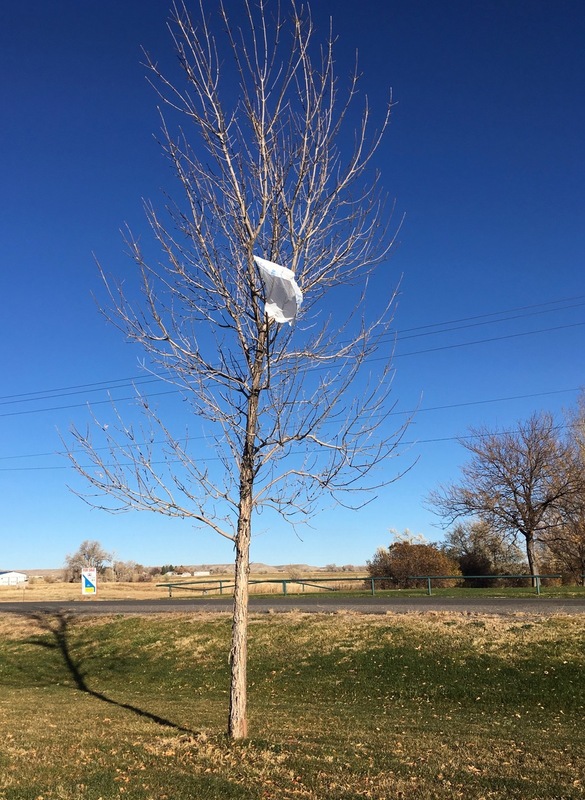 Mr. Arnold was demanding, and the results were phenomenal for a small school. One year the choir was recorded on reel to reel tape, and a small record was produced, basically unheard of in those days. I still have that record. 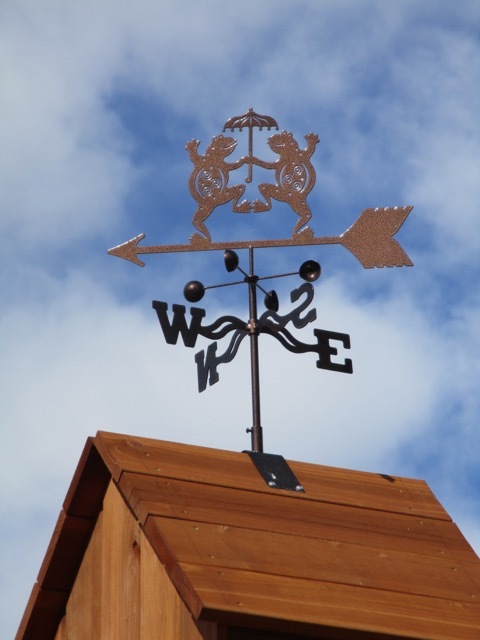 The song that popped into my head and prompted by the weather forecast was "Something Told the Wild Geese." The weatherman and my long-lasting memory were correct . . .
and continued throughout the day on Thursday. 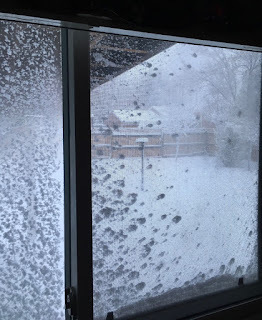 The whisper became a shout, "Winter is here!" Other photos of the market can be seen here and here. I enjoyed visiting Singapore and would love to return. I enjoy wearing the Colorful Hitchhiker so much that I'm knitting another from a skein of Noro Kureyon Sock Yarn from my stash. Other than the blue border, Morse Code was made entirely from strips from my 2.5 inch scrap bin, which makes me very happy. When the Picot Dot Wrap/Shawl came off the needles last week, it didn't look very appealing. Actually, it resembled a colorful sting ray. I seriously questioned whether the pronounced hump in the middle would even come out in the blocking, but . . .
with a few hundred pins, I managed to straighten the edge. 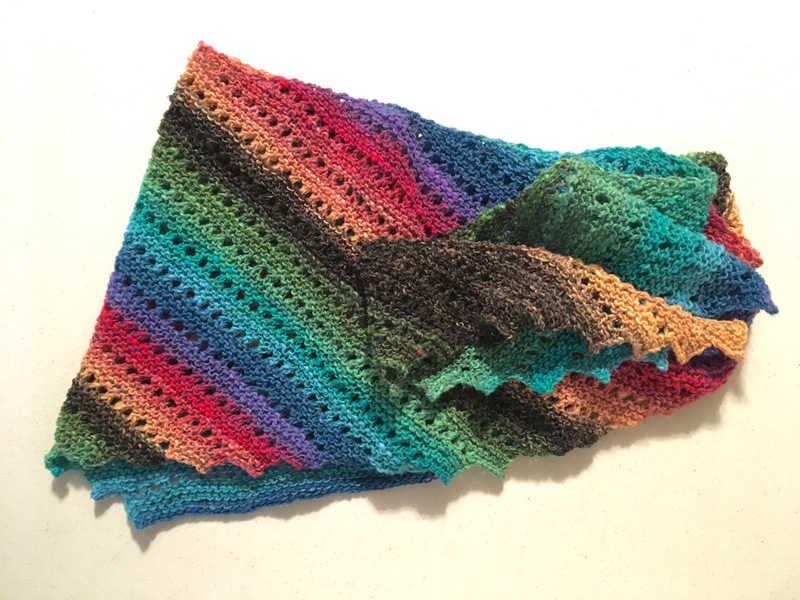 Once the shawl dried completely, it was ready for its photo shoot. The center hump is slightly visible, but it has been tamed enough to wrap around the neck. 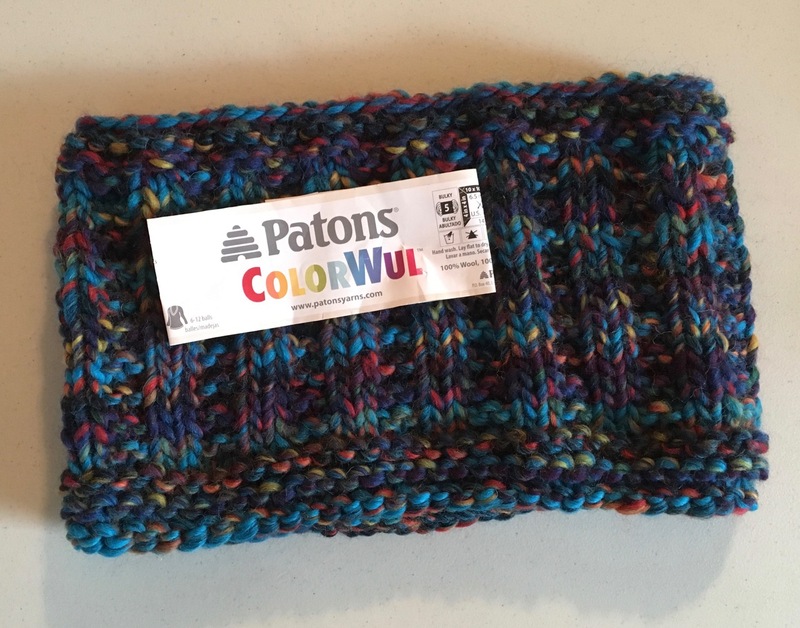 The pattern states the kit will make 2 shawls - colors reversed. My finished shawl used 154 total grams of wool, and I have 146 grams remaining. 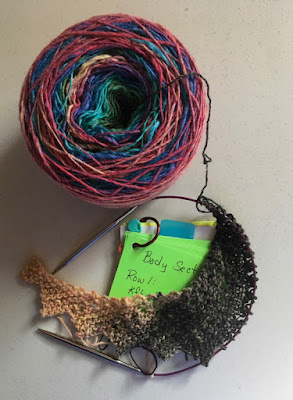 By adding a bit of another black yarn, I will have enough to knit the second shawl. 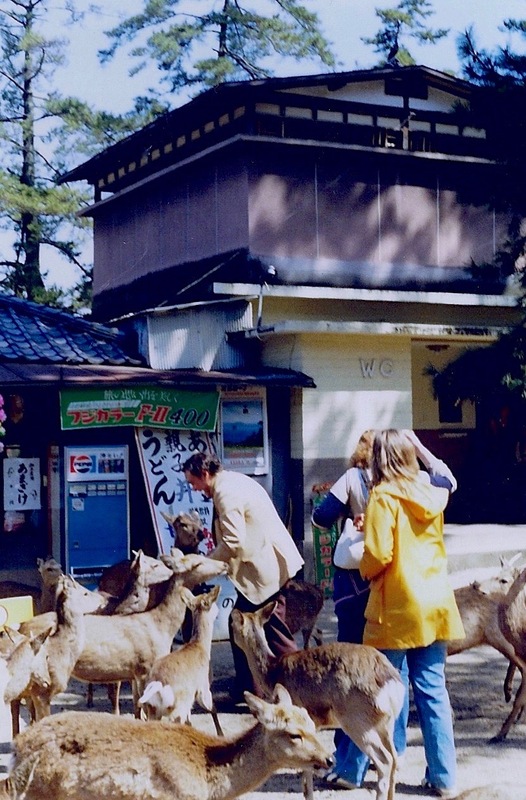 I didn't write about the deer in my travel journal, so I don't know specifics of the location, but the deer roamed the grounds of this area freely and welcomed being fed by the tourists. I went on several of Paul Gsell's trips in the two years I was in Japan. 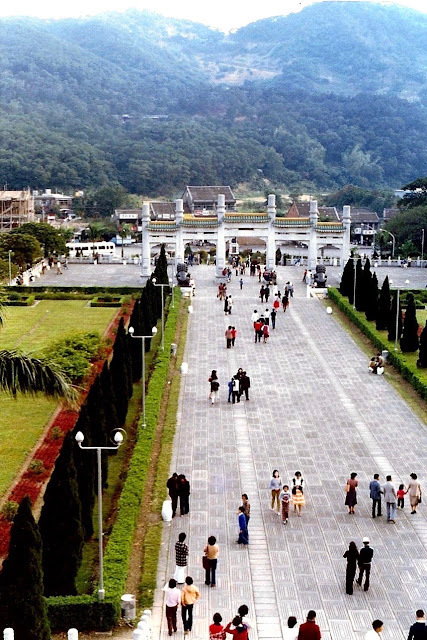 Here's one entry from my travel journal: Thurs., April 3, 1980 - Last night we took a walking tour of Kumamoto with Paul and discovered a small restaurant. We ate whale and horse meat (raw and dipped in soya sauce), drank potato wine, which was very bitter. The owners of the sushi and sake bar (see this post) took a liking to our group and gave us gifts (I still have the wooden sake cup) and entertained us. We drank beer and sake. As our meal was being prepared, Judy L. took a position behind the counter and "helped" cook. She spilled potatoes everywhere much to everyone's amusement. 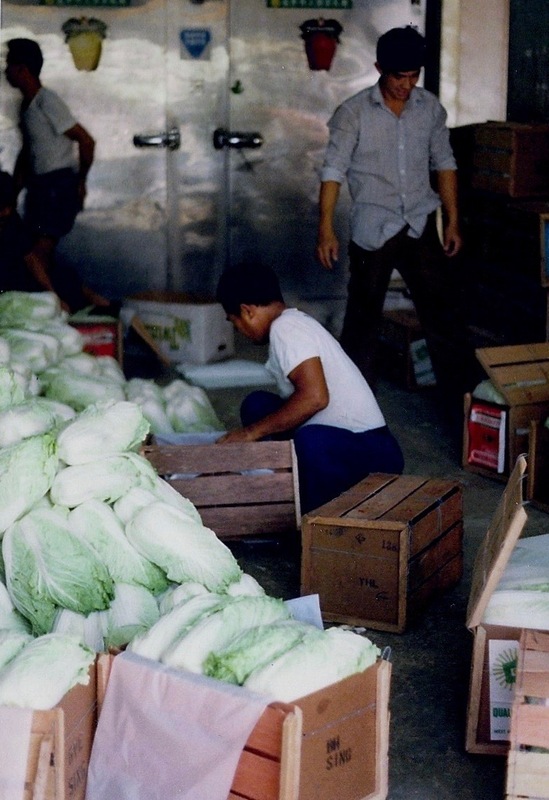 Judy L. and Judith K. became known as "cucumber" because the owners could not say "Judy." It was a very enjoyable night. 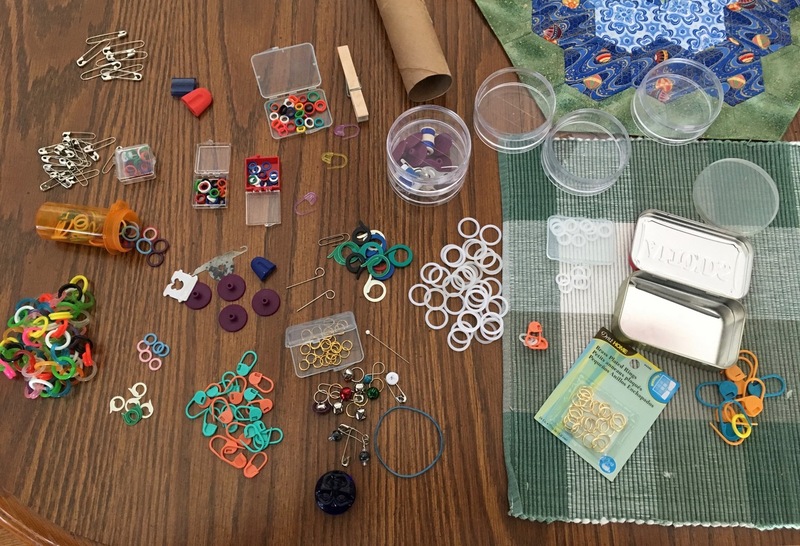 Sheri and I met one day in late October to make prototypes of the project we would be presenting to the monthly sewing group. Sheri had already made hers (shown on the right), and I was making mine to see if it could be completed in two hours. I used Sheri's machine that was totally unfamiliar to me, so we had to stop the clock for a bit to address some technical problems (empty bobbin, broken needle, etc.) I managed to complete my bowl holder in the time allotted. 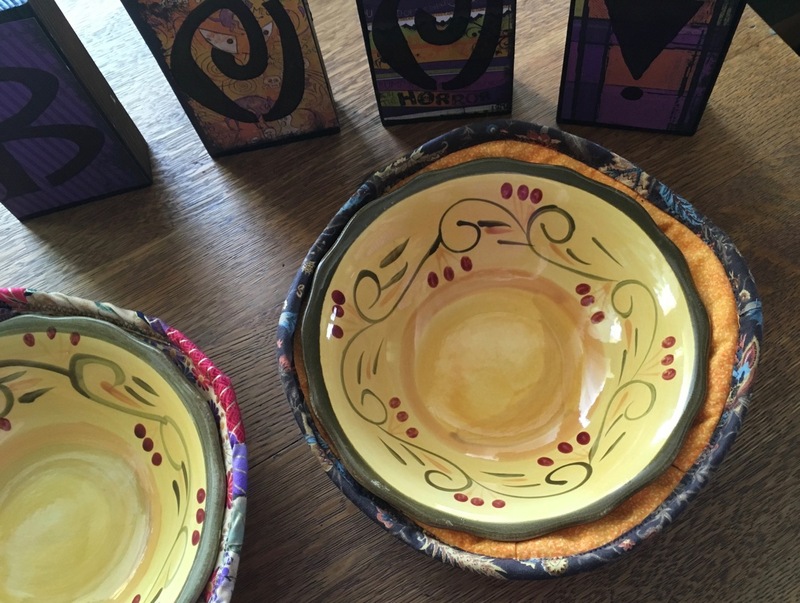 The bowl holders are reversible. 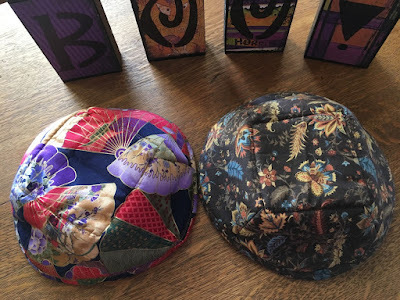 I used two fat quarters (FQs) from a bundle of Asian prints I purchased several years ago. 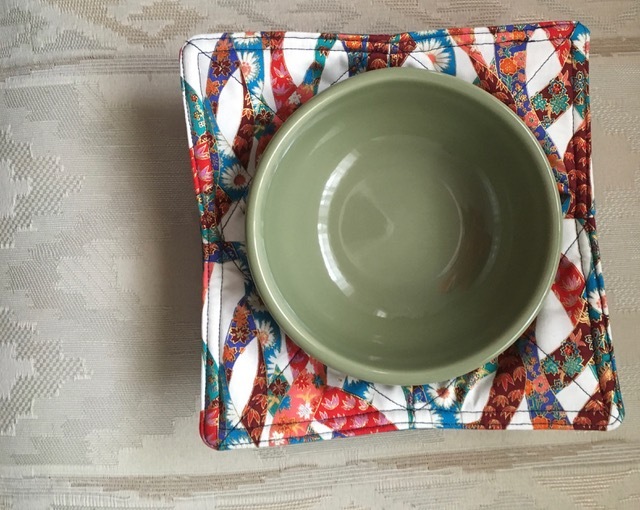 If you aren't familiar with cloth microwave bowl holders, they hold a bowl as its contents is being heated in the microwave. The edge or wings on the cloth bowl holder are used to lift the bowl safely out of the microwave. Sheri and I used this pattern. When I got home, I looked for a pattern that did not require binding and found a free square pattern that can be made to fit a variety of bowl sizes. It was easy to make, and I like the wide wings for lifting. I used the remainder of the Asian fabric to make one for Marilyn, Brenda, Sue, and myself. 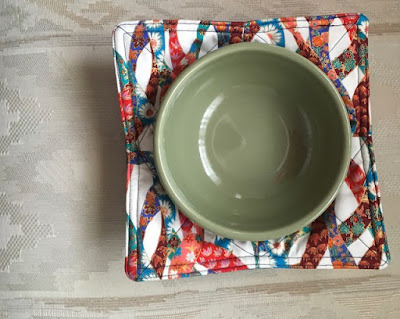 Do you use cloth, microwave bowl holders? As the stitch count gets bigger, visible knitting progress slows. I'm enjoying knitting this pattern, but I'm not crazy about the yarn, especially the number of knots and weak Russian joins it contains. I'm nearing the border rows, so the bind-off is getting closer and closer. 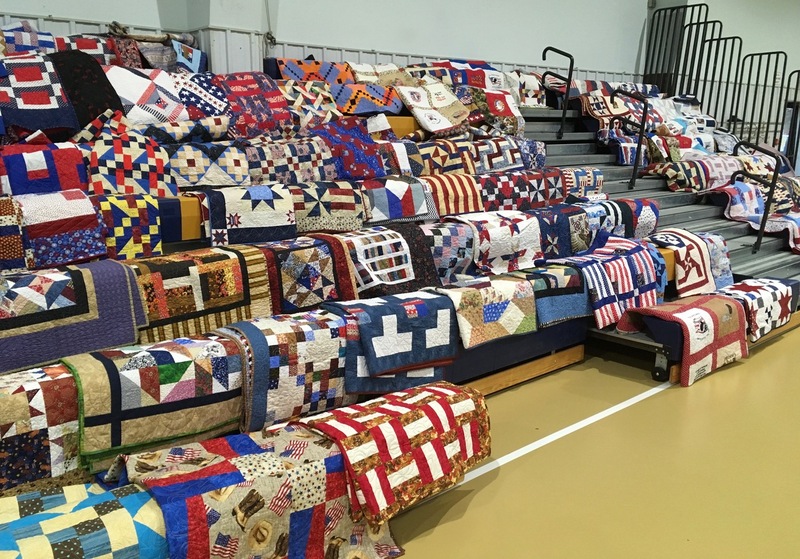 Last Tuesday, I joined numerous volunteers, families, friends, and veterans for a large Quilt of Valor presentation. 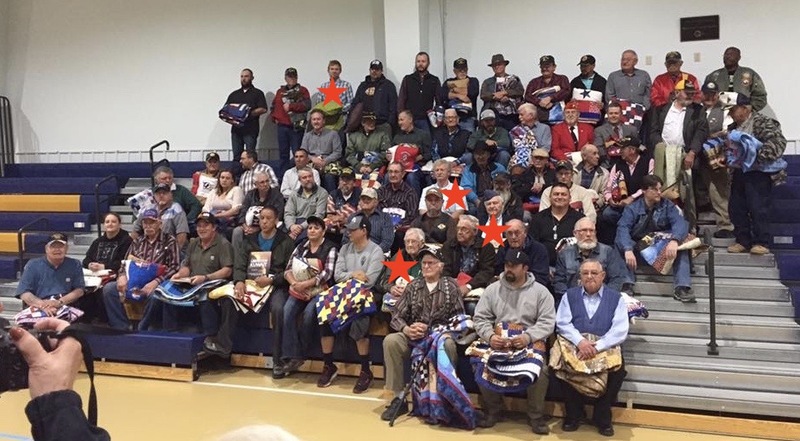 I haven't heard an official number on how many quilts were presented, but I'm guessing it was over 80 (some veterans were unable to attend, so their QOV were presented to family members). 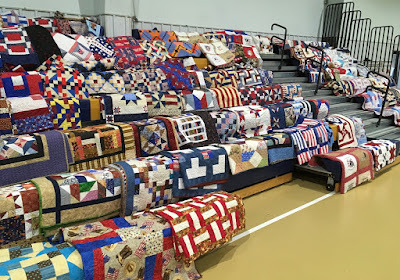 The Quilts of Valor (made and quilted by volunteers) were placed on the bleachers, and the veterans were asked to select the quilt that spoke to them. The display of quilts was breath-taking. With military precision, the event started promptly at 7 PM with the presentation of the Colors. The military history of each veteran was read as he/she walked to the front. The QOV they selected was displayed for everyone to see, the quilt was wrapped around the shoulders of each veteran, and the presenter gave the honoree a "welcome home" hug. 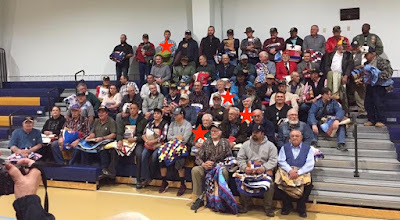 I was happy to see both young and old veterans receive a Quilt of Valor. It was an amazing evening. The red stars on the group photo indicate the veterans who selected a QOV that I made. On this Election Day, let's remember it is individuals like those pictured who defend our country and our freedom. Today as citizens, it is our duty to VOTE. The old Lander Mill building is now a bicycle shop, and the bottom section has been recently remodeled. 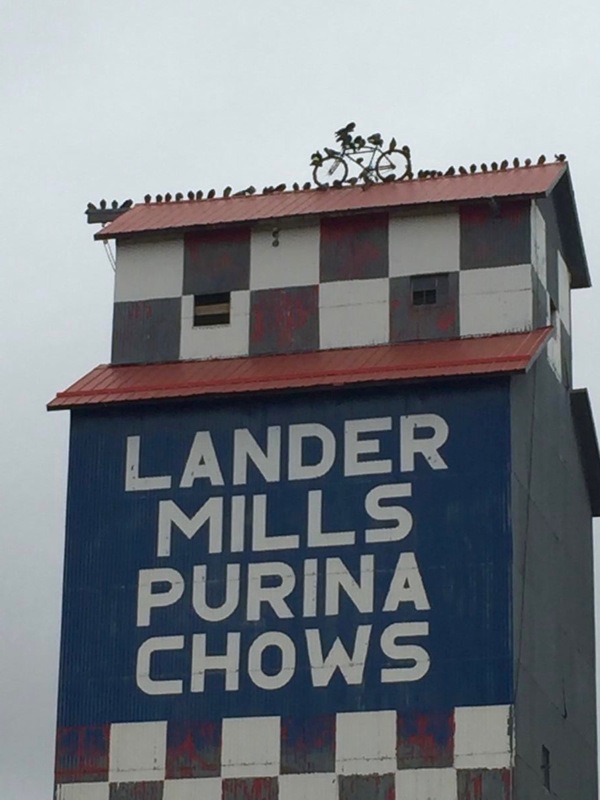 Previous posts about the old mill building can be seen here and here. An earlier post at the museum can be seen here.